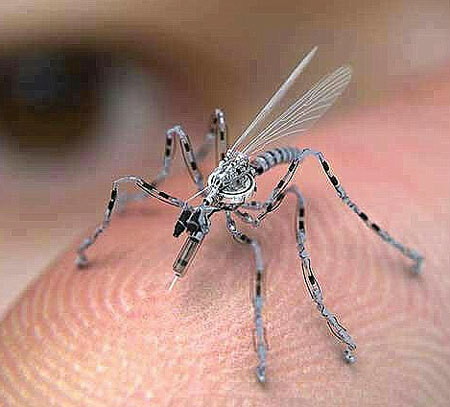 U.S. Government Developing Insect Spy Drones-Truth! - Truth or Fiction? U.S. Government Developing Insect Spy Drones-Truth! Reports allege that the U.S. government is developing an insect spy drone the size of a mosquito that will be able to capture photos, sound recordings and DNA samples. Insect spy drones have been in development by the U.S. military and a number of universities for years, but the extent of the technology’s functionality is unknown. In 2008, the Air Force Research Laboratory set its sights on developing a tiny, armed drone that could be used by U.S. Special Forces to track and terminate “high-value targets,” Wired.com reports. The goal of the project, dubbed “Project Anubis,” was described in the Air Force’s 2008 budget as the development of a small unmanned aerial vehicle (UAV) that “carries sensors, data links and munitions payload to engage time-sensitive fleeting targets in complex environments,” Wired reports. The fate of Project Anubis is unknown, but similar micro drones have been used and tested in the battlefield. U.S. forces in Afghanistan reportedly tested the Black Hornet drone, which is about the size of a hummingbird, in 2013. The Wasp drone, which weighs less than a pound and measures about 28 inches, has also been used by the military. Schools like Harvard, MIT and Norte Dame are developing micro-robotic insect drone technology, too. Harvard’s RoboBees are being developed to pollinate field crops, explore hazardous environments and carryout military surveillance. It appears that insect-sized micro drones may be a reality in the future, but it’s unknown how close we are to that point. One minute of prayer each night-Grass Roots Effort! President's 13 Year Old Daughter Spent Spring Break in Mexico-Truth!